French designer Philippe Starck has designed a motorbike for French motorcycle manufacturer Voxan. According to Motorcyclists Online, it's a prototype and it's called the Café Racer Super Naked. More information to follow soon hopefully but for now here's some images. "VOXAN the exclusive and unique French motorbike brand presents its new extreme vision of the café racer. With the “super naked Xv”, Voxan by Starck. Raw power enhanced by the radical purity of the minimalism. The absolute essence of the motorcycle. 1200 cm ³. 140 horsepower 180 kg. Order on internet. Available beginning last quarter 2007. 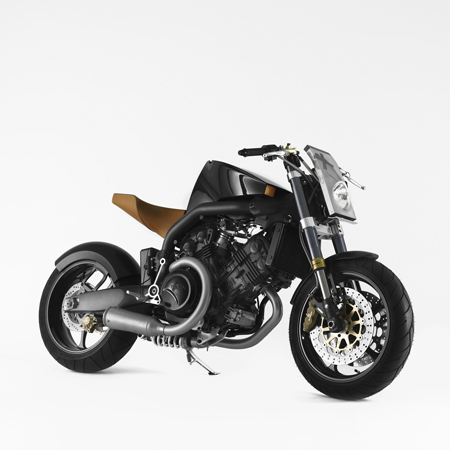 ""VOXAN the exclusive and unique French motorbike brand presents its new extreme vision of the café racer. With the “super naked Xv”, Voxan by Starck. Raw power enhanced by the radical purity of the minimalism. The absolute essence of the motorcycle. 1200 cm ³. 140 horsepower 180 kg. Order on internet. Available beginning last quarter 2007."